Microsoft has promised that their next console, Scorpio, will be "the most powerful console ever," and today the company delivered on that promise, revealing a set of beefy specs that, in terms of raw power, surpass any video game console on the market today. It would obviously surpass PS4P but I had no idea by how much. Not knowing anything about computers, I still don't. I might actually agree with this tweet I found. Price point almost always wins and that won't change no matter what shinies MS trots out. Microsoft's console is pretty much a wasteland filled with Halo and Killer Instinct. With Scalebound getting canceled almost every Microsoft exclusive is up for the same fate and we're not sure if they even care right now. Combine that with Windows taking almost everything from the XBone there's almost no point to having a console on the market. Scorpio is going to need a reason to exist beyond the usual console fare right now. Otherwise, you're better off getting everything they release on PC. Dedicated consoles are a doomed market unless they can fill another roll beside the PC/smartphone combo to which people are accustomed. It may be a step behind in terms of home-console, but the Switch is portable and versatile in how it can interface with its user, and I think that is very important. Pricepoint aside, I very much want micro 4k tech to be a thing so we can push VR past the screendoor bottleneck. We're on the rise just before the crest of the hill. PlayStation has been doing well, I think it's just Microsoft that's doomed. If they pull out then PS5 is going to have virtually no direct competition and the brand will only get bigger and better. Unless they mess up badly I don't see why they'd be in trouble. They'll definitely sell some of these to existing One owners, but I'm not sure how they're expecting this to expand their market. If I'm a PS4 owner interested in 4K, I probably already bought a Pro, and the power difference isn't likely to convince many to jump. If I'm a PC owner interested in 4K, then I can get a 1080 and 4K monitor for about the same price as a Scorpio and 4K TV, and it's hard to see why I wouldn't go for the proven library. If I'm a Switch owner interested in 4K, then I'm clearly beyond traditional economics ability to understand. Even people who just want the most powerful everything are presumably bankrupt from NVIDIA one-upping themselves every few weeks. If they want this to work, they need exclusives that anyone beyond existing Xbox owners cares about. So, how much more powerful than the PS4 Pro is it? The question of success with Scorpio relies on a few axes: cost, timing, and game exclusives. I agree with the concept of price, though I might extend that to be "If Scorpio is $100 more expensive than PS4 Pro, then game over." Their announcement is already after the release of the PS4Pro, and that's going to hurt them if the cost is already a factor. Their market right now is people who've either already bought the Xbox One or otherwise aren't Sony-first and care about 4K resolutions and now also either don't have a PS4Pro or have lots of money at their disposal. I do wonder how big their market is and just how much this is going to do for them. If they released it this holiday, that might help buy a little bit more success in terms of sales in order to turn back the tide against Sony kicking everyone's butts, but we'll have to see. Likewise, I think in general that Microsoft has pigeonholded themselves into being the place that has Halo and other first-person shooters (and yes, KI), so the battle lines for what games they have won't matter much unless Microsoft moves the line or becomes more indie-friendly. Sony seems to be the indie darling of late with Nintendo starting to significantly make up ground, so I'd love to see Microsoft be more adventurous with first-party games beyond their current slate. Ultimately, yes, Scorpio might be the most powerful console in the world now, but that doesn't matter if devs can't make it live up to its family name and face full life consequences. Simply put, I do not foresee 4K gaming on Scorpio. To render 4K at 30fps, you need to be able to do 1080p at 120fps because you're enlarging the graphical surface area by 4x. 120fps really isn't something consoles can do, so I don't see going full 4K any time soon. And I don't think the improvement in the specifications sufficient to make reliable 4K gaming a thing. Unless you're doing something super simple (e.g., not a HD full-quality first-person shooter) of course, but again that's Microsoft's bread and butter. The problem with the Xbox one right now is that MS doesnt' seem to be as willing to publish games besides Halo and Killer Instinct. Nintendo and Sony are. (Well... Sony to a lesser extent. They sure didn't as much with the Vita.) They were at the very least TRYING with the original Xbox and the 360, but somewhere in the midst of the last generation, everyone started to prefer Sony instead when the PS3 became a monster with exclusives (And a lot of Japanese developers who gave the 360 a chance decided to give MS the middle finger and release a better version on the PS3 anyway.) Nintendo meanwhile is publishing all sorts of games for their systems - even though all everyone seems to want are Mario Kart and Smash bros. (I love seeing people say "Nintendo needs more IPs" and then I point out how many they publish that nobody buys). ^While that's all true, don't forget that the Vita and One both outsold and outlasted the Wii U. Nintendo's insistence on making it difficult for anyone else to publish on their systems is an even greater problem, and it's too early to say if they've fixed anything with the Switch. Another of MS's problems is that they can't decide whether Xbox is meant to compete with or exist alongside PC gaming. When MS announces some new game, it might come to PC, so anyone interested isn't sure if they should bother with a One. Then when it does release on the god-awful Windows Store, no one can be sure if it's going to follow Quantum Break and end up on Steam eventually. They're losing console sales to people hoping games come out for the system they've already got, and they're losing store revenue to people hoping ported games come out on a less s*** storefront, to say nothing of completely losing customers who get bored of waiting and find a different game. Compare with Sony: If there's a PS4 game you want, they're happy to let you stream it to PC, but it's obviously never being ported, and you're going to need a PS4 or (soon) pay $15 a month for PS Now to do so. ...but I can't find any data about console ownership overlap, so it's also entirely possible that I'm wrong and every One sold was to someone who also owned a PC. Anecdotal evidence says otherwise, though. and d), in the case of Skylanders, is on literally everything BUT PC because that's Skylanders for ya - Imaginators still released on the PS3 and the 360. The bloody 360. People want good new IP. Arms seems like sh*t, Steam was sh*t, and I don't think Boxboy is exactly what everyone wants from Nintendo. Even though I have no interest in Splatoon at least it was a real attempt. I don't think they've really done that since Pikmin. Nintendo always claimed that the Miis was their first new IP since Pikmin, and I don't think fans necessarily treated that in the same perception. Miis were, as I think gamers viewed them, a context; they were self-insertion characters that, hypothetically, could be involved in any sort of game. Essentially, when it comes to Nintendo, gamers conflate actual characters with IP, and Miis weren't characters in their own right. The Wii years were pretty much a dearth of "new IP" if you discount the Mii franchise. There have been a few other odds and ends as you look it of course, but I think the expectation for Nintendo is akin to the expectation of Pixar; unless you're going to make characters and scenes that knock our socks off, it doesn't count. However, this is veering slightly away from the subject of Microsoft, but I figured it was good to put it in there for context. It's not Nintendo's fault Mario and Zelda are what sell the most. True but that doesn't mean they can't put some money, time, and effort into a new AAA IP. I think they have enough depth in their existing IP that they could get by just working with that, honestly. They've got almost every major genre besides horror and PC-centric stuff like 4X covered by IP, and they've shown an impressive aptitude for reimagining existing series in recent years, so I don't think they necessarily need to sacrifice brand recognition to explore new spaces. As long as their efforts are more Breath of the Wild than Star Fox Zero, it'd be really hard to beat the free marketing from hype around a new Metroid, F-Zero, or Earthbound entry. Of the top 24 games on PS4, 8 are exclusive to Sony systems. One (Nier: Automata) is only otherwise available on PC. One more (Resident Evil 7) has a PSVR exclusive bonus mode. Of the top 12, 7 are some level exclusive, and all but one (Watch Dogs 2) released this year. We get another 4 exclusives in the next 24. Of the top 24 games on One, none are currently exclusive to Xbox. Five are only otherwise available on PC, and of those, Quantum Break and Dead Rising 4 both received delayed releases there. Of the top 12, 4 are some level exclusive, but three of those and 5 of the 12 overall are from last year. None of the top 6 (vs 4/6 for Sony) are any kind of exclusive. Including the next 24 gives us another two exclusives, one of which (Recore) was quite lukewarmly received. The Switch only has 7 games, and only 3 are any kind of exclusive, but one of them is Breath of the Wild. That's been such a system driver that it's currents sitting at 5/7 in popularity, presumably on account of the fact that everyone bought it outright instead of renting. If we want to be silly and include handhelds, every single 3DS game is some level of exclusive until Corpse Party at #38. Nearly all of the Vita's top 24 are exclusive, with the exceptions both being Zero Escape games. 40+ million units sold doesn't sound like a failure to me, but they've got a lot to work on if they want to be serious contenders for the sales crown next time around. 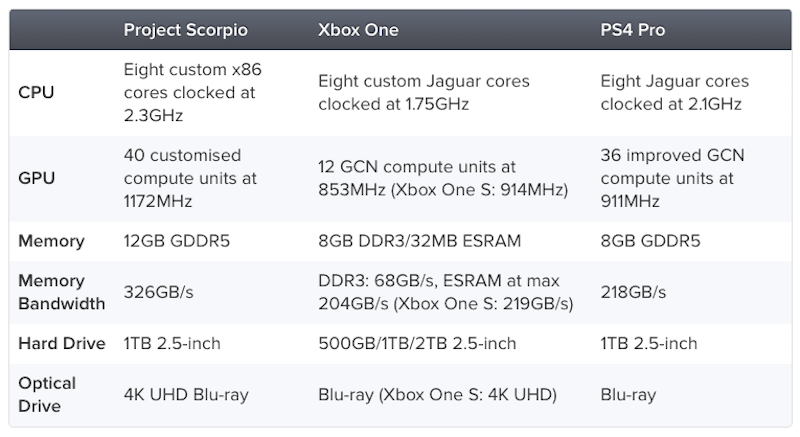 The Microsoft Scorpio is going to generate so much heat with those specs holy ****. But you're going to see a loss of consumer trust with this new console being released so soon after the Xbox One's release. Do devs really have the technology to produce something that can utilize all of that power at this stage? "the most powerful console ever"
Can't wait to get one of these!